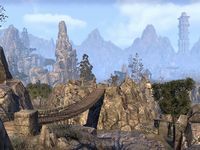 Craglorn is a region in northeastern Hammerfell, at the foot of the Dragontail Mountains. It is situated between High Rock, Skyrim and Cyrodiil. The southern part of the region, called Lower Craglorn, consists mainly of dry wastelands, with some green areas near the bodies of water. A gate in the western mountains connects the region with Bangkorai. The main settlement is Elinhir, a city heavily influenced by the Colovian culture, located in the easternmost part of Lower Craglorn. Elinhir lies very close to the Skyrim town of Falkreath, which is just across the border to the northeast. The northern part of the region is called Upper Craglorn. Its landscape is rugged, mountainous, and very similar to the Reach, which is just across the mountains to the north. The main city, Dragonstar, lies in the northwest corner of the region. Craglorn was home to many different civilizations in the past. Ayleid, Dwemer and Yokudan ruins are common in the region. It was also the last bastion of the Nedes and the remnants of their civilization can be found here. In the northernmost mountains of Upper Craglorn, old Nordic ruins can also be seen. This page was last modified on 9 November 2018, at 12:30.